Inside the North Wing Tower. One of the first things you notice upon approaching the Winchester Mystery House is that the front door is not aligned with the roof peak above it—it is staggered slightly to the right. This might be a minor detail, but it hints at the disorder that unfolds within. 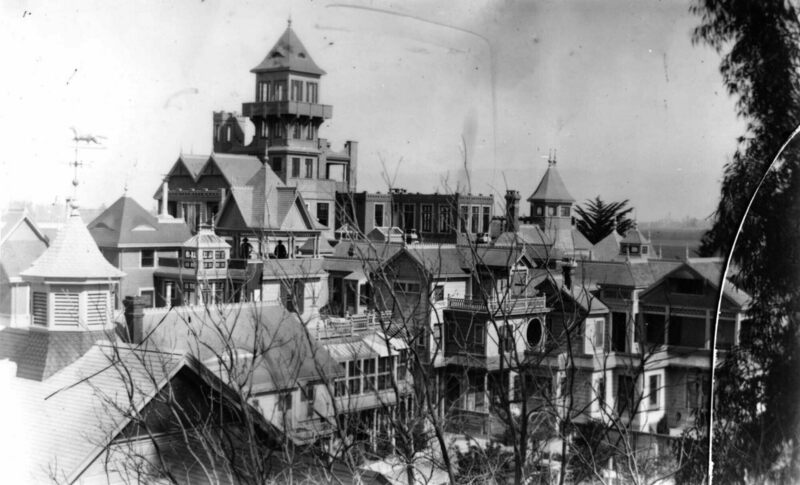 The mastermind behind this architectural oddity—a sprawling Queen Anne Revival with 160 rooms—was Sarah Winchester, the widow of the rifle magnate William Winchester. Famously private and eccentric, she built onto her California home on and off for more than 30 years. Legend has it that she did it to appease or confuse the ghosts of people killed by Winchester rifles. Getting to know the house is, in a strange way, like getting to know the woman who built it—and no ghost stories are necessary to marvel at its creativity and ambition. Winchester inherited $20 million after her husband died in 1881, and not long afterward moved from New Haven, Connecticut, to an eight-room farmhouse in orchard-studded Santa Clara Valley. She got to work almost immediately. A dedicated crew of carpenters built new rooms so quickly that no one bothered to draw up blueprints. And she didn’t hesitate to make unorthodox building decisions—a stairway ascending to a wall, a closet about an inch deep, a “door to nowhere” that opens to empty space. After she died in 1922, the businessman John Brown rented the house, christened it a tourist attraction, and later purchased it outright. It has been a beloved piece of quirky, creepy Americana since it opened. More than 12 million slack-jawed visitors have followed a planned route through Winchester’s singular vision. One particular attic space took the most effort, says the longtime house historian Janan Boehme, who helped with the restoration plans. “That essentially was just a platform with holes in it. There were staircases and things, but there was no railing, there was no safety at all,” she says. “If you walked across, you’d just fall through a hole.” The maintenance team had to build a new wooden walkway through the space. Damage from the 1906 earthquake. There’s a way that these reports of hauntings, the mythos behind Winchester herself, and the staff’s enthusiasm for it all create an atmosphere of suggestibility. The new Winchester movie plays on that idea, and so do some of the newer upgrades that have been made to the house. Taffe, who used to work at a theme park, has a nose for this kind of theatricality. He and his team recently perfected a high-octane sound clip that replicates the 1906 earthquake that brought down the house’s turreted tower and trapped Winchester in the scroll-covered Daisy Bedroom for hours. “Here it comes,” Boehme announces. “This is the full-length one.” As a speaker in the nearby bedroom emits a rising bellow, the floor starts to shake. Sounds of smashing glass and crockery punctuate the rumbles. Instability is an ongoing presence. In the Daisy Bedroom—which is on the original tour—Winchester rang a bell to summon her servants, who couldn’t find her in the chaos. To this day, the cracked walls and torn wallpaper from that night remain, as do the panels of stained-glass flowers that give the room its name. “How would you feel if, all of a sudden, you got knocked out of bed by an earthquake?” Boehme says. “You think the world is coming down around your ears.” After she was finally rescued, Winchester left the house and stayed on a houseboat in San Francisco Bay for a while. Perhaps the boat’s steadier rocking helped quell her fears. The Witch’s Cap in the South Turrett. The remnants of the seven-story tower that toppled during the 1906 earthquake—finials, rails, and decorative trimmings that rained down like beads from a chandelier—are kept in the cavernous attic space. To make it accessible to visitors, Taffe’s team has fitted the area with myriad handholds and stabilizing planks. Eventually, the path leads up to the Witch’s Cap in the South Turret, billed as the highlight of the new tour. To reach it you must pass through a corridor scaled for a child’s playhouse, narrow and scarcely five feet high. There’s light flowing in from occasional windows, but even so, it’s hard to orient yourself in space as the walls close in. The Cap is an unfinished round room constructed with redwood beams. When you stand precisely in the middle of the turret, your voice bounces uncannily off the walls. Boehme says that a visiting psychic described it as a great place for a seance, and reportedly that’s what drew Harry Houdini to the house in 1924—but he was less interested in communing with the dead than with proving that the entire practice was bunk. No one knows what happened, but Houdini found the visit memorable enough that he sent a newspaper clipping about it to the house’s owner. The entrance to the basement. There are hints that Winchester did have an interest in the supernatural—the house’s stained-glass spiderwebs and its repeated tributes to the number 13 (windows with 13 panes, ceilings with 13 panels, and staircases with 13 steps) don’t seem like accidents. Such beliefs wouldn’t have been particularly unusual at the time. 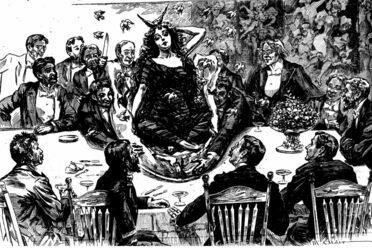 In the late 19th and early 20th centuries, there was a surge of what was called spiritualism all over the country. “The Civil War fed it,” Boehme says. “All these women, they lost their husbands, their sons, their brothers, their fathers. And they were sad and desperate for a way to see that they were okay.” Winchester herself was dealing with the loss of her whole family. But the house’s central legend—about it being haunted by the ghosts of people killed with rifles—doesn’t come from Winchester so much as from the house’s early promoters, as well as a 1967 book called Prominent American Ghosts by a psychic named Susy Smith. Boehme finds that the legend has little power to explain Winchester’s unusual construction ideas. “Guns were looked at differently in those days. They were a necessity of life,” she says. “A lot of stories were told about her way before she died, even. She really wouldn’t engage or talk to the press because they said such bad things about her.” During her lifetime, her silence likely fed all sorts of rumors. The Winchester family grave in Connecticut. Sarah Winchester in a carriage. But those stories do, in some way, conceal the real Sarah Winchester. Publicity-shy though she may have been, she was more anchored in the real world than the spirit one. The consensus among the house’s staff is that she was a creative do-gooder who endured through profound personal loss. “She would give to causes that were dear to her, and she’d usually do it anonymously,” Boehme says. She paid her workers far more than the standard wage, and kept them on for many years in part because she wanted to ensure their livelihoods. Ignoffo speculates that she threw herself into her all-consuming building project to feel closer to her late husband—architecture had long been one of William Winchester’s passions. As you walk away from the house’s manicured grounds, the polished facade of the upscale mall across the street smacks you in the face. And you begin to realize that there’s a comfort to the house’s curling, hidden spaces, a freedom in its eccentricities, a majesty in its abstractions. There’s a thrill, too, in knowing that Winchester likely hid some spaces so well that no one has seen them for over a hundred years. “There’s very possibly things we haven’t discovered yet, just because we don’t have blueprints,” Magnuson says. There’s solace in the idea that, even in privacy-phobic Silicon Valley, there are still secrets at the house—and plenty of questions that don’t really even need answers.